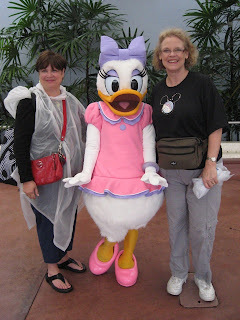 I went to Pinterest and typed in Disney World. There were lots of pictures, but not many memories to help people getting ready to visit. So here goes. I posted it under Fun With Kids, even though I go with my grown up friends (and my kids) nowadays. I am going to post these memories as bulletins. Meeting a friend's family and her grand kids at the Cape May Cafe in The Yacht and Beach Club resort. They have a buffet that starts EARLY and can accommodate big groups. 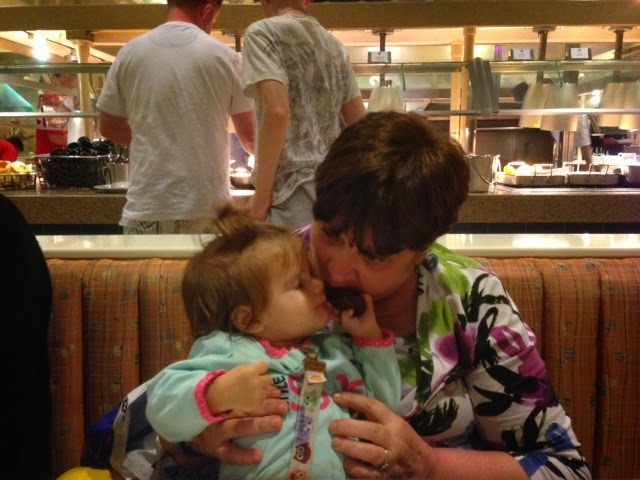 Here is Emily, ten months, offering me a brownie. They put white paper on the table with crayons for the kids to draw on. The lifeguard let us go through the heavily guarded pool (because it's so crowded) to get pina coladas. We sat outside the hotel on the porch overlooking the pool to have our before dinner drinks. Going on my birthday. The resort gives you a birthday badge. They encourage you to wear for your whole stay. Practically every cast member yells, "Happy Birthday." Even better, they start giving you free stuff, like desserts, cookies, drinks, balloons. Then, they had cast members come to the door of our room with a special surprise. This was sooooooooo much fun. Eating at "Mom's Diner" at Hollywood Studios. They had the kids stand in the corner because they wouldn't eat their vegetables. All in good fun. Eating at "Starlight Cafe" in Hollywood Studios. You eat in a CAR while watching black and white movie clips as if you were at a drive in. They have BOTTOMLESS milkshakes at the Wilderness Lodge's Whispering Cafe. Eating here is like going to dinner theater, because they do wacky things. Watch out if you ask for ketchup. Something fun is going to happen. Just sitting in the lobby with the big fireplace is awesome, but we adults especially like the uniqueness of their gift shop. Renting the water sprite jet boats behind hotels on the lagoon of the Magic Kingdom. You don't have to be staying at the hotels (or even on property) to rent these. I think it is my FAVORITE thing to do in Disney World. I love seeing the Magic Kingdom from the water. Going pool hopping if you're a Disney Vacation Club member. Some pools are restricted during peak seasons, but otherwise, if it's hot we're in a pool in the middle of the day in park-hopping nearness. Waterslides don't have the long lines that the parks do. Bring a backpack and use the lockers at the park you're going to attend. LOCKERS ARE WONDERFUL. SINGLE LANES at Test Track and other big rides. We stand in line together, then hop into different cars for almost no wait time. My family agrees the trade-off of separating is sooooooo worth doing this. Tom Sawyer's Island. We go over every trip and scream our heads off in the cave. It's not scarey at all (until we get there). Then we stand outside and listen to all the next visitors start screaming their heads off. You can have a nice relaxing lunch at Aunt Polly's and wave at all the people going by on the Riverboat. Howling in line at the Haunted Mansion at night. Soon, everyone's doing it. Yelling "Marco" in long lines, and hearing "Polo" yelled back. My Girl Scout troop knowing and singing all of the Disney songs on the multiple bus rides. Buying fun light stuff in parks and sharing them with kids on buses. Buying flashing glasses and the whole family wearing them to watch the parade. Riding the Tomorrowland People Mover over and over with our hands in the air, so that people below think it's a scarey ride. Staying late for extra hours and not waiting in long lines. If you have to buy one of these tickets, DO IT. Each park has extended free hours anyway if you're staying on property. Having dinner in Cinderella's Castle. Wearing crowns as a group. Sitting on Cinderella's THRONE--okay so it was the toilet in the restaurant, but we all got a kick out of it. Finding street entertainment that's so fun to participate in. Listening to jazz band in hotels. Seeing Kevin Bacon in Hollywood Studios on New Year's Eve one year. Disney passed out free hats and hot chocolate that night as we saw the Osborne Lights. Looking for Hidden Mickey's everywhere. There's a book you can buy there that tells where they are. Now there's even an app. EAT AT ESPN zone at Boardwalk. You can eat at ANY of the resort restaurants. But this restaurant has the biggest hotdog you'll EVER see...and the biggest slice of chocolate cake. Yelling, "Hello, Donald" to every duck you see. Talking your older sister into going on her first roller coaster ride. It was Mt. Everest. We told her it was an easy ride. I showed her the defibulator on the wall. I let her know that if her heart stopped, Disney could start it again. She hated the ride(she said it was too scary), but loved being in the middle of a great story. Stay at the Beach Club at least once during your lifetime. You'll find out why that fabulous pool with it's lazy river is so popular. It has sand on the bottom. And a built in lazy river. And a GREAT water slide, and water falls, and whirlpools. Go to the Polynesian Hotel and relax, have drinks on the beach. Wait for the water parade and the park fireworks. Build a sand castle. Goofy threw my daughter in the pool. Where else in the world can you make a statement like that. We also entered a hoola-hoop competition. No one would sign up until the "old" lady did. I'm not that old, but it started things. I like to start things. Having a list of unusual people traits for the kids to find. I made them so unusual, but the kids found them all. From someone with hair down past their bottom, different colored toenails, handlebar mustaches, etc. Coming up with the idea of having the characters sign the kids white t-shirts instead of autograph books. Knowing to take your socks and shoes off on the Rapids Ride in the Animal Kingdom. Riding bikes in Fort Wilderness. Seeing the horses, relaxing on the beach, and campfires. Can't get into the nightime Musical Revue--go for BREAKFAST. Breakfasts with the characters are FUN, FUN, FUN. Going to the Contemporary Hotel for dinner. A must do. Go early. Walk over to the Magic Kingdom for the evening afterwards. Or order hamburgers at the cafe on the level with the stores. Sit in the bar and eat them and wait for the water parade. Having a fancy lunch at the Grand Floridian. Using the pool all afternoon afterwards. Shopping at Downtown Disney. Take the bus from your resort. Easier than parking. Eat at the new Dinosaur restaurant. Find an outdoor band. Dance. Breakfast at the Old Mill at Port Orleans. YUM. FUN. Unlimited breakfast at Whispering Canyon in Wilderness Hotel. Great place for breakfast meetings with friends and family. Learning how to get a 2" memory foam mattress topper in a airless bag (you use vacuum). No one regrets using the pull out couch because they're so comfortable now. We leave it pulled out and ask maid service for an extra bedspread. Everybody flops on it when they come into the unit. Making our own sign on a stick for the family to find in big crowds. If it starts RAINING, head for the parks. Lots of people will be LEAVING. 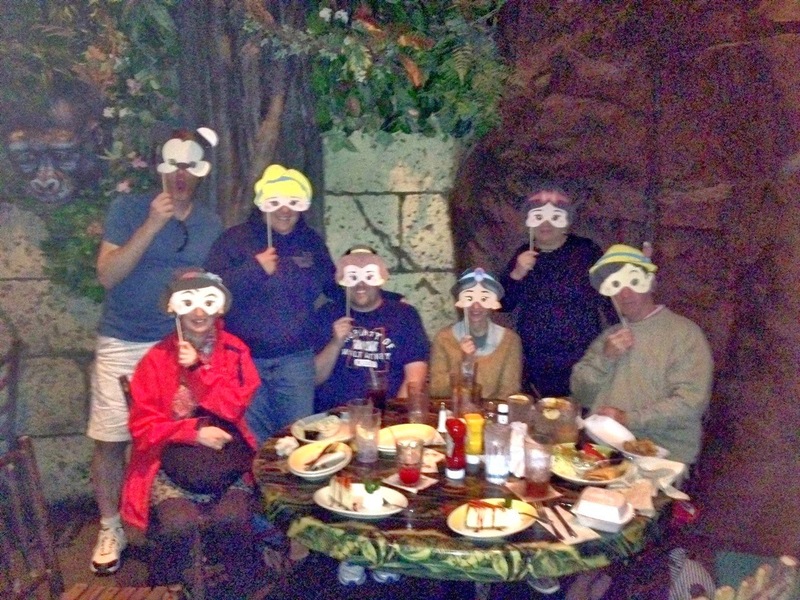 Eating lunch in Adventure Land at Peco's Bill. A must do. Going on Splash Mountain, Runaway Train, and Space Mountain during parades. Watching little kids wonder at the talking trash cans. Buy those water bottle fans. When kids were little, I brought them with me before Disney sold them. Watching the Dancing Fountain at Epcot. Seeing Illuminations from the Canada pavillion. Don't skip Norways ride--or Mexico's. Shop the Pavillions in World Showcase. Japan's is extra fun. Don't miss the model trains by Germany. Don't even think about not having a French pastry. Do your best to eat a Chinese meal at their fabulous restaurant. Soar at Epcot has interactive video games. Get into them. Start cheering. Everyone's mood picks up. Make SURE to grab a quick, but relaxing dinner at the Food Pavillion in Future World. Are the lines so long the kids are crying and you're ready to do the same? Call a taxi? Have drinks inside the Polynesian Hotel. Meet your friends there. Get one of those Disney photo passes. You download the pictures when you get home. What a great memory. Do ALL the 3 -D movies. Buy a plaque on the path. Go with your family to polish it. Have Disney people laugh when they find out what you're doing. Ice Cream, ice cream, ice cream. Tomorrowland Restaurant. Do this. Easy. Relaxing. Gathering Place. I used to threaten my kids that if they cried, I'd make them go see the Tiki Birds. Unfortunately, they loved the show, but it was a fun threat. Don't say you're too old to ride the carousel. Track down the shows. Don't skip them. Don't even think about not going to the Lion King show at the Animal Kingdom. AMAZING. Take the boat ride between Epcot and Hollywood Studios. 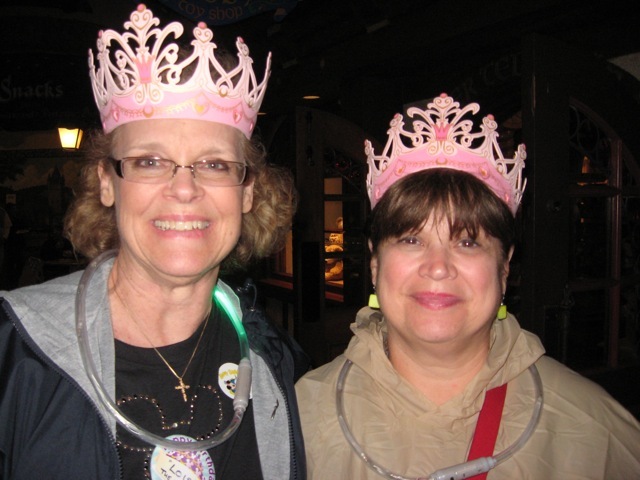 Animal Kingdom lodge has night goggles to see animals at night. Their bar and restaurant is something you must see. Haven't been to Disney at Halloween. Go. We're planning on going on the cupcake crawl this trip. Google it. 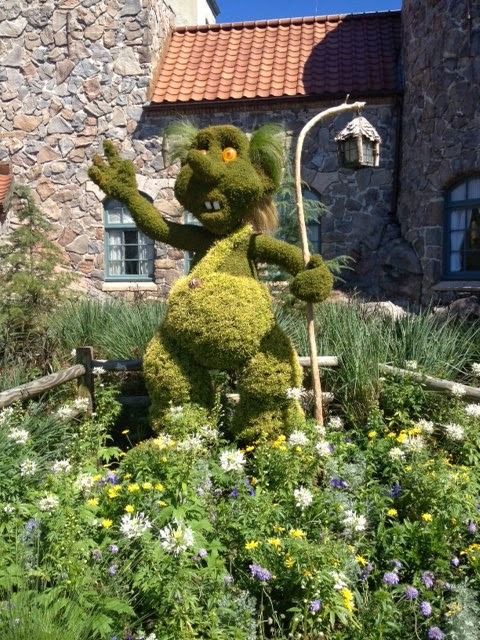 Lots of people online have talked about the Rose and Crown restaurant at Epcot. I've eaten at the Chinese Pavilion's restaurant. It was awesome. And not outrageous. Going to the Whispering Canyon Cafe after checking out of the hotel. Having lunch there, then sit out by the pool while waiting to go to the airport. 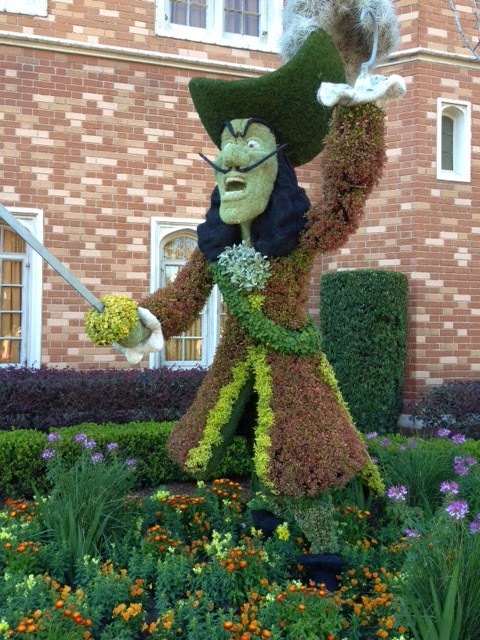 Going to Epcot's flower show in March and seeing all the characters as topiaries. Start your day at Epcot's World Showcase in Paris. Have breakfast there. 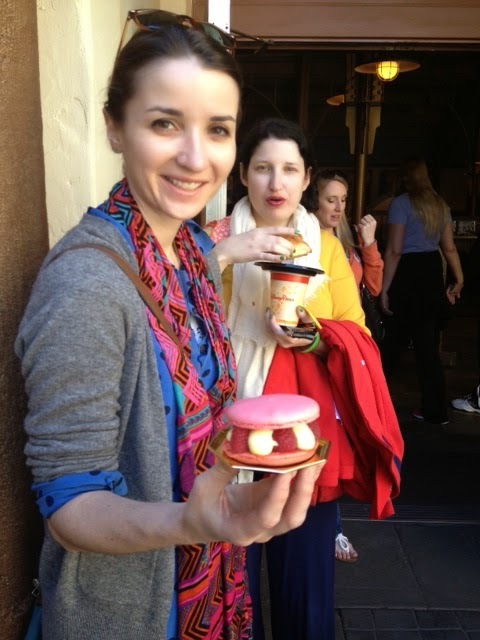 Look at the huge macaroon my daughter is holding. It had a lime filling with fresh raspberries on top. They have sandwiches on bagettes also. Hungry? The American Pavilion just added a smoked house with barbeque offerings. The hot dogs and hamburgers on the other side of it are good. Watch the ducks come for handouts. Don't even THINK about not going on the Norway ride. Make your own Disney Masks. Wear them out to dinner with friends. You can grab the patterns here. Think you're too old to wear a costume? 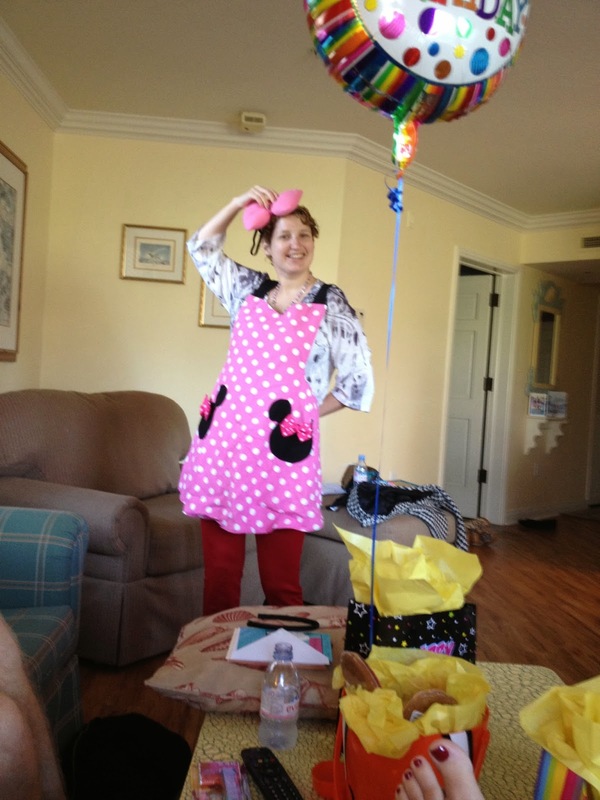 Well, go to Etsy.com and buy anapron to wear around your Disney Time Share Unit while cooking. 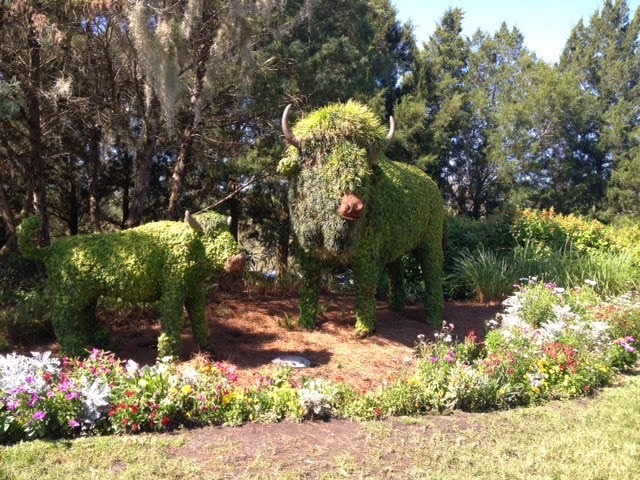 Don't have a DVC membership? It's the BEST BUY I've ever done. They come with kitchens. Go to Disney at Halloween time. EVERYONE wears costumes. Pay to go into the after hours party. Buy a box of chocolates. Sit on the curb waiting for the parade. Meet people by offering them candy. It makes the waiting more fun.